Vietnam has an endless list of dishes that can be eaten for breakfast but this is one of our absolute favorites! Simple, healthy and delicious, banh cuon is a must try when in Vietnam. You’ve already known that banh mi is one of the top favorite breakfast in Vietnam. So, what about others dishes on the delicious breakfast list? Today, you are going to discover one of the most interesting and oldest breakfast dishes in Vietnam: Banh cuon – Vietnamese steamed rice rolls. Let’s go back in time to Prince An Quoc’s era (roughly 300 BC). Ancestors of the Vietnamese moved to the region which is known as Thanh Tri Ward (Hanoi) today and started to grow rice there. The Steamed Rice Roll was thus born. Two millenniums passed by, the dish spread around the country, and now has become one of the most popular breakfasts of the Vietnamese of all social classes. Banh Cuon sounds pretty easy to make, however, requires a certain extent of skill to roll a good one. The original Thanh Tri version contains no fillings. Slowly, Banh Cuon with various fillings and styles came by. Basically, we could divide the standard serving of Banh Cuon into three main parts: the soft rice cover, the sophisticated fillings, and the tasty sauce. The manner of eating Banh Cuon differs from the North to the South of Vietnam. 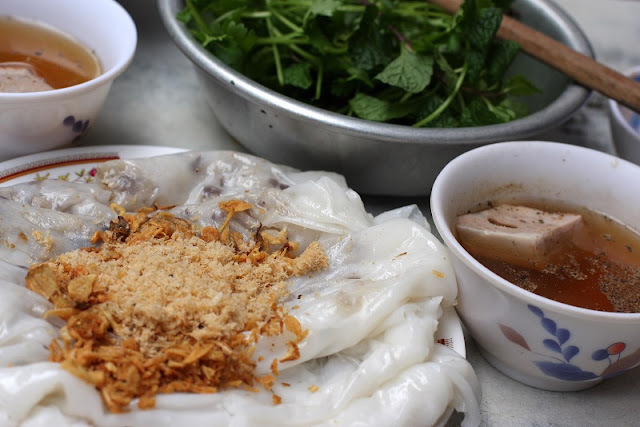 In Hanoi, a serving of Banh Cuon usually involves three plates and one little bowl. Our tasty, ready to use sauce comes in the small bowl. Banh Cuon rolls, optional sausages, and spicy vegetables are on separate plates. The diner would take one piece of Banh Cuon and dip it into the sauce before enjoying it. You can eat the sausages and vegetables as you prefer. In the South, Banh Cuon, sausages and vegetables come together on the same plate. Guest would pour the sauce directly onto the plate, turn the rolls upside down to equally spread the flavor, and then enjoy everything all at once. At Hanoi: Banh Cuon is a must try specialty in Hanoi. Banh Cuon Thanh Tri (from Thanh Tri ward) should definitely be on your to-go list. Ba Hoanh Banh Cuon store on To Hien Thanh street offers one of the most favorable dishes in the city. If you are pretty much into the chicken, do not forget to drop by Thanh Van store on Hang Ga street. Chicken with Banh Cuon is really rare, yet people seem truly love it! If you’re tired of the constant noodle soups and rice, banh cuon is worth a shot for a perfect breakfast in the trip to Vietnam.